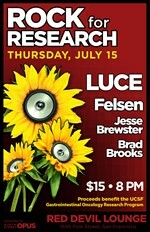 Felsen, a classic and Indie rock band founded by drummer Andrew Griffin, Luce, Jesse Brewster and Brad Brooks held a benefit concert on Thursday, July 15th at 8 p.m at San Francisco's Red Devil Lounge. Proceeds from this exciting evening of music and dancing supported the research of the UCSF GI Oncology Research Program, led by Robert S. Warren, MD and Alan P. Venook, MD, research seeking to discover new and potentially curative treatments for gastrointestinal (GI) cancers. Andrew Griffin recently appeared on KFOG's Local Scene to promote this benefit concert. The GI Oncology Program wishes to thank Felsen, Luce, Jesse Brewster and Brad Brooks for supporting its research.